Sometimes glossy, sometimes shimmery, but always richly colored: That's the beauty of liquid eye shadow. A relative newcomer to the world of eye makeup, liquid shadows are available in a variety of formulas and shades. They are especially effective in creating a luminous, natural look, and are favorites during the steamy summer months when the weather is known wreak havoc with makeup. In other words, this versatile product is also exceptionally long lasting! The most common eye shadows are powder formulas, but cream formulations come in a distant second. Creams are often relied on to create a soft base for a powder shadow to adhere to. They also work in a pinch when pressed for time. Instead of going through the hassle of applying various powder shades to the brow bone, crease and lid, a cream can easily be smeared on with a finger and blended just as easily. Equally easy to apply, and growing quickly in popularity, are liquid formulas. One might expect applying a liquid shadow to be quite a messy undertaking, but the truth is they're the exact opposite! Smartly packaged in small bottles or tubes and complete with a sponge applicator, these shadows glide on easily and dry on contact with the skin. As mentioned, they're particular popular during the summer, when perspiration and humidity are common causes of fading makeup, and they typically last until removed with a strong eye makeup remover. Even those committed to powder and cream formulas may be interested in giving the effortless liquid shadow a chance. They can easily be worked into any eye makeup look and are available in a number of colors, ranging from vibrant jewel tones (perfect to wear during fall and winter) to light, airy shades (ideal for spring and summer). 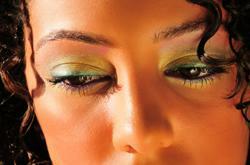 Many cosmetic companies have introduced liquid eye shadow to their lineups. They're not all the same, though! Just as powder shadows have their own unique traits - some are shimmery, some matte, others loaded with glitter, still others designed to provide a two-tone effect - so too do liquid formulas. No matter what type of eye look you hope to achieve, you'll find a liquid formula to create it. If you're a party girl with a tendency to go for the dramatic, bold eye, consider one of Underground by Rimmel London's Shake It Up! liquid shadows. Do as it says - give it a little shake - and watch as the pearls and pigments mix together. Apply it to your lid and achieve a sparkling, pearlized finish that's sure to turn heads. Best of all, you won't break the bank with this brand! Someone had to do it: DuWop has created Shadowlift, a revolutionary liquid shadow with anti-aging properties. In addition to nourishing the delicate eyelids, the shadow also tightens gently, resulting in a more youthful appearance (with a pop of light color, of course). Maximize your powder shadows and transform them into liquids. This not only saves you a little bit of money in the long run, it also breathes new life to your makeup collection and opens up a whole new world of fun eye looks to play with. Purchase a formula, such as Urban Decay's Eyeshadow Transforming Potion, to transform your powders into liquids. The water-based formula is enriched with emollients to keep your eyelids in great shape, too! The double-ended product allows you to draw a thin line along the rim or try a more dramatic look with the wider brush. Simply dip either brush into your powder shadow and enjoy a whole new look!